Where the pavement ends, the fun begins. 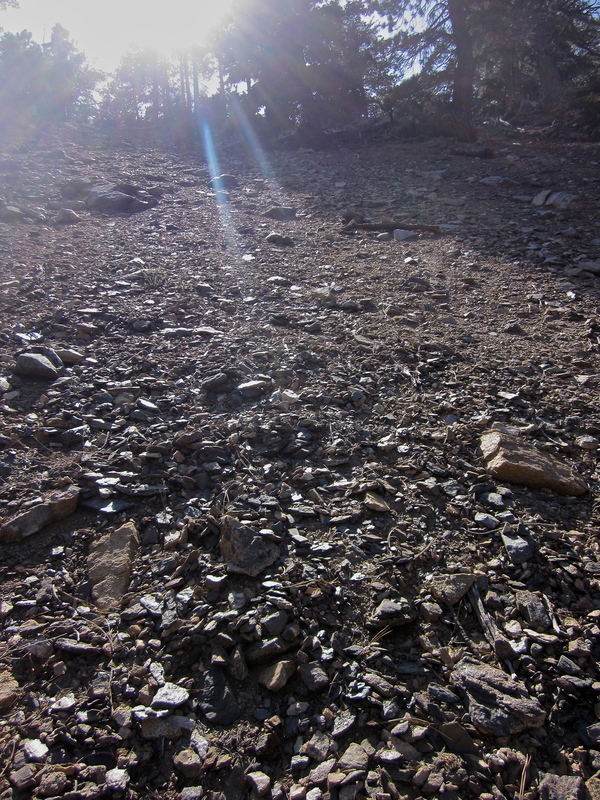 Type of trail: Out and back, composition: sand, decomposed granite, soft soil, rocks. Approximate elevation: Trailhead-5,400ft., Top of trail- 6,800ft. 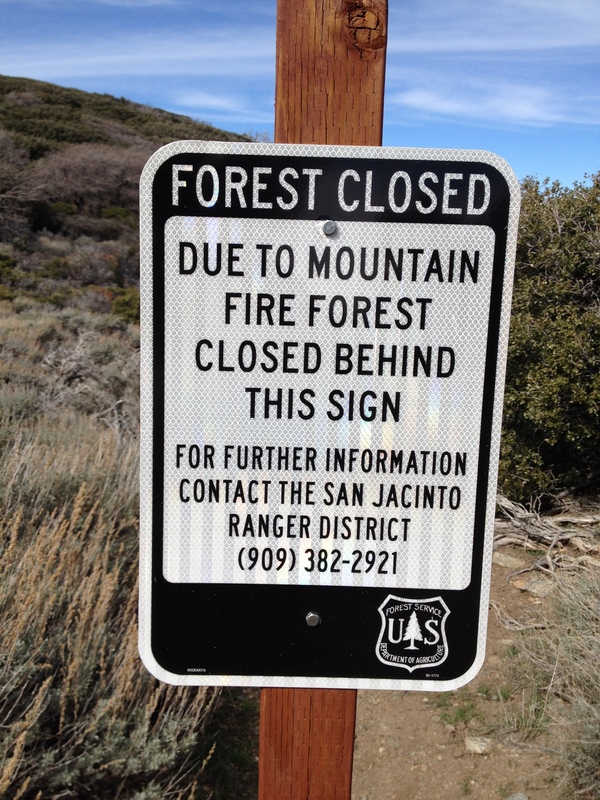 The fire affected an approximate 10 mile section of the Pacific Crest Trail and a half-dozen trails throughout the San Jacinto Forest area. 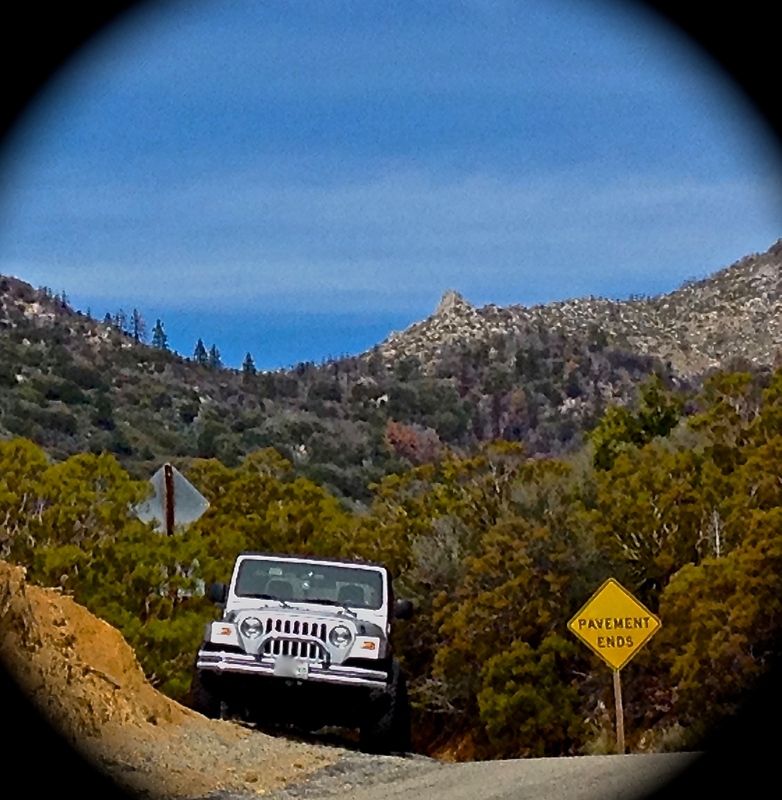 PCT hikers in 2014 and again in 2015 will have to detour onto Hwy 74 before getting back on the trail near Idyllwild. 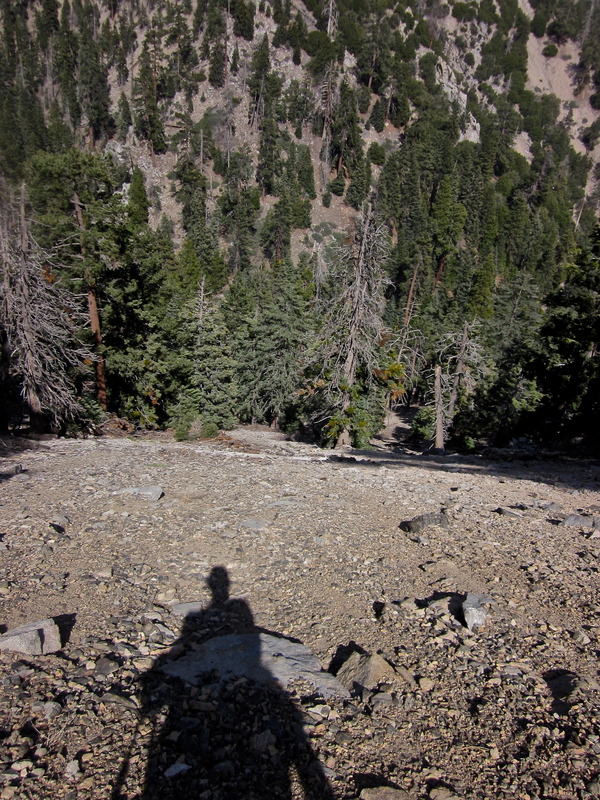 It also destroyed one of our favorite trails – Spitler Peak. We would find a trail just south of the burn perimeter named Cedar Springs Trail. It’s located off of Hwy 74, about two miles from the junction with Hwy 371 and four miles south of Lake Hemet. There is a trail marker along the highway and a paved road takes you up and over a ridge several miles to the trailhead. 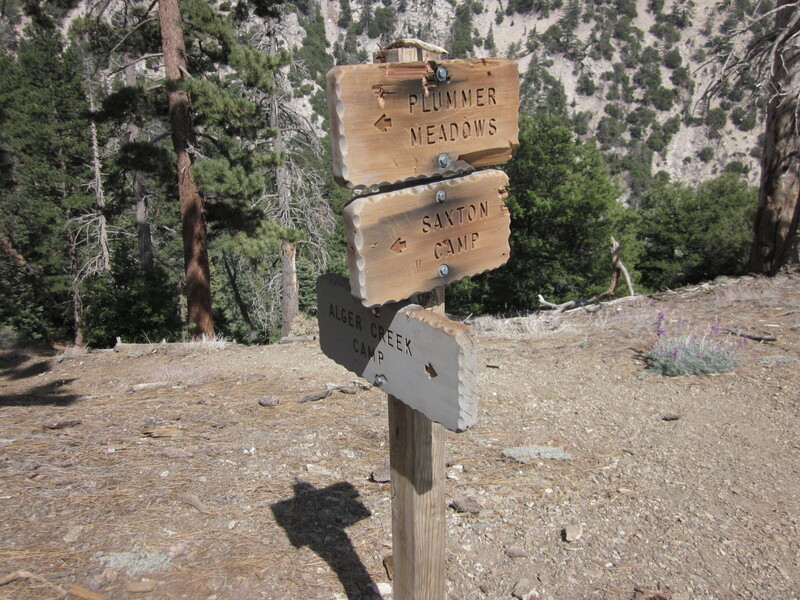 The trail is located on private land, named Camp Scherman – a 700 acre camp owned by the Girl Scouts of Orange County. The pavement ends about 100 yards past the trailhead and parking is very limited, you basically have to angle your vehicle on the inclined hill. The path starts out on a fire road and makes its way into a wooded area through a gate. There are several gates on this hike; not sure why but suspect there are horses or maybe some free range cattle. We paralleled a dry creek bed and the trail becomes a rocky, rutted path that appears to be a dry creek. The oak trees are the dominant tree and offer nice shade. We came up to a picnic area consisting of two tables near a meadow. To the right, the trees and shrubs are concentrated in a riparian area. We noticed a ribbon of a stream about 25 yards off-trail. Ahead was an ominous sign that made us giggle. Up until this point, it was a leisurely walkabout along a fire road and a riparian path through the woods. Now, we would hit some switchbacks and begin a gradual climb. The views usually get better when you have switchbacks. If nothing else, the perspective changes. 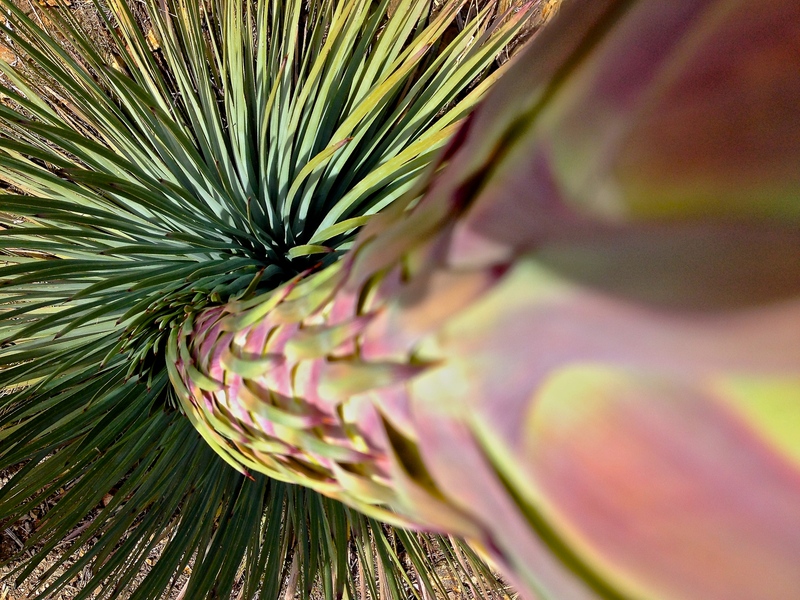 The hillside was covered with young yucca plants and skeletons of the old ones. It’s an interesting plant and can live for many years. I suspect the average life of this variety is less than ten years. Some species live to be over a hundred. We rounded a switchback and were confronted with a mixed breed Rottweiler off-leash who was barking angrily at us. I got in front of my wife and held out my poles in case he charged. Three women were about 50 ft. behind and his owner tried to get him to stop advancing and barking at us, but he wasn’t very obedient. Eventually, she got him under control and we passed. I love animals, but some breeds are a bit intimidating on the trail. I reigned in my frustration over the incident and hiked on. As we hit a summit and intersection with the PCT, we also saw some other signs which were disappointing. Sign at the junction of Cedar Springs Trail and the PCT. Aww man! Oh well, we will just hang a right and go south on the PCT for a bit. 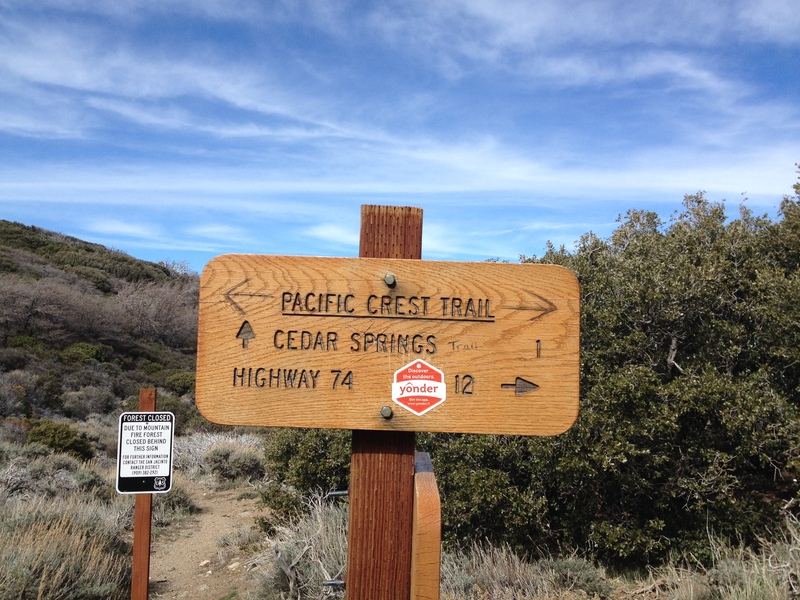 We removed the graffiti sticker on the PCT sign. The wind picked up as we trekked south and eventually we found an area sheltered from the wind looking down into the desert. 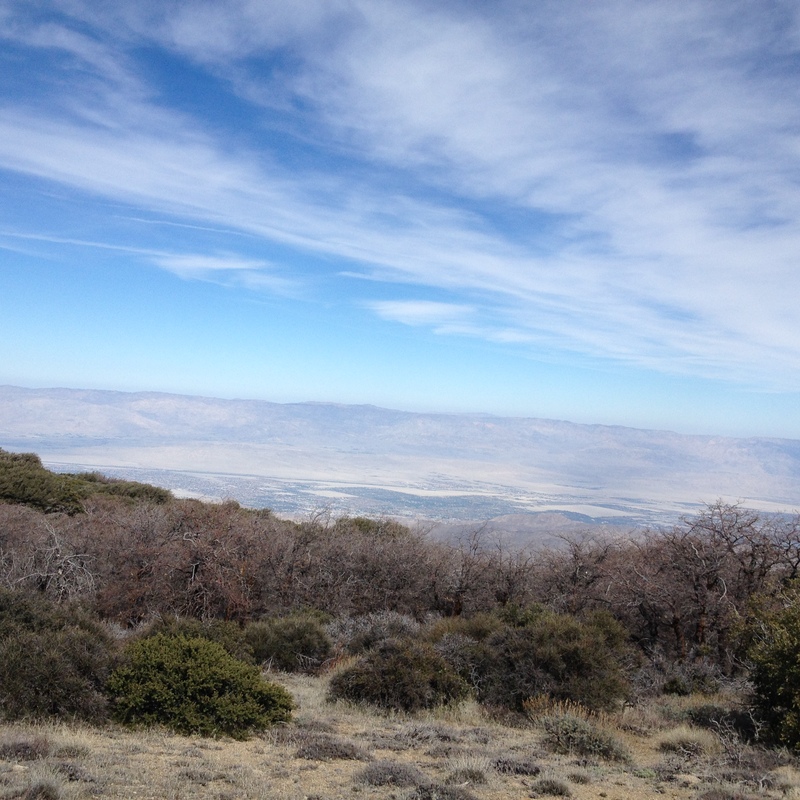 View from the PCT into Anza-Borrego Desert. As we enjoyed the solitude and had our lunch with some hot tea, I noticed someone passing about 30 ft. behind us moving fairly quickly. I don’t believe he saw us because we were down behind some rocks. After lunch, we hit the trail for our return trip. Within a few minutes, we ran into the guy who passed us. He looked a bit frazzled and stressed. He had a distinct British accent and mentioned that he had been lost for several hours just south of here and was supposed to meet his wife at a restaurant nearby. I assured him that he was on the PCT heading back in the right direction. This gentleman was out alone, no map, no backpack, a GPS with a dead battery and a 20 oz. bottle of juice. We made sure he was ok and followed behind him. He was moving quickly and eventually disappeared. Our descent was uneventful as I reflected back on another enjoyable day on the trail. While the beautiful Sierras are the ultimate eye-candy, the short hikes on the PCT near our home are a good prescription for the office cubicle doldrums. 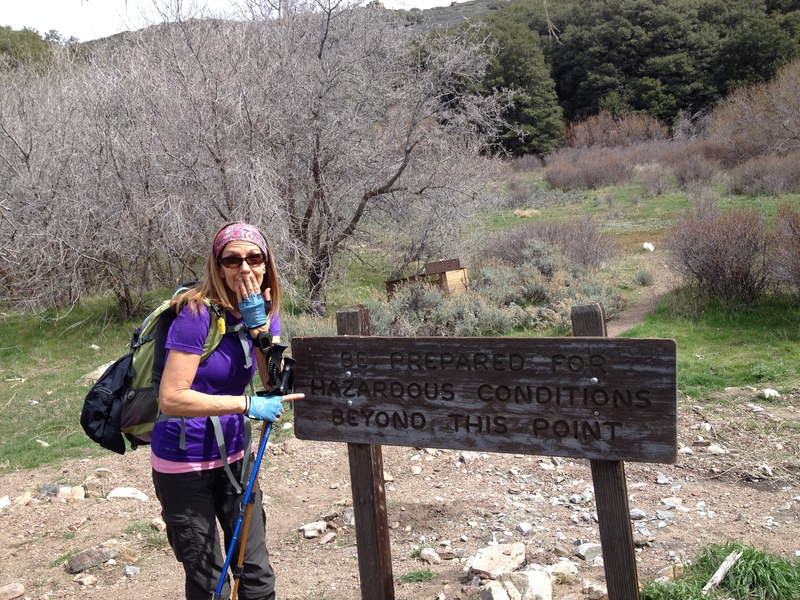 – When day hiking, I carry a little extra water and snacks in case we run into a lost hiker. – If you get lost, take a break, calm down and try to get reoriented. – If you are hopelessly lost, do not get off the path. Stay put, eventually you will be found. This is Part II of a story that I started a few weeks ago…. 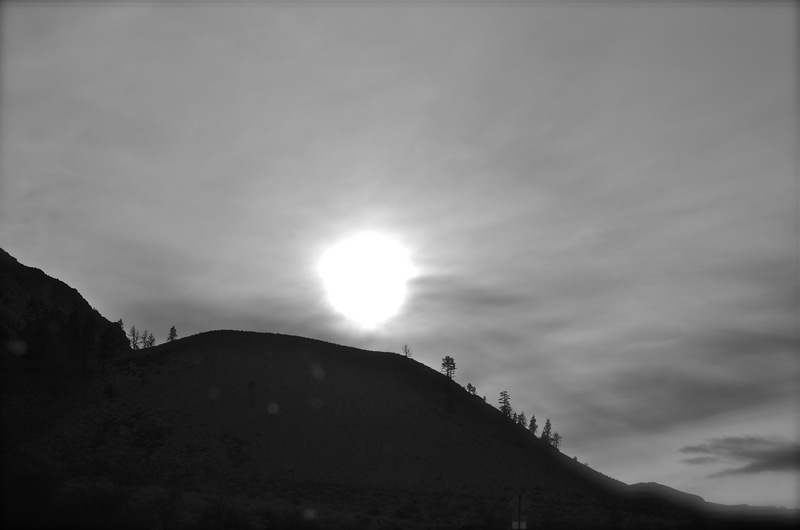 The temperature dropped quickly after the sun settled behind the ridge. Before it got totally dark I had gathered up some rocks and made a tiny fire pit on the ledge. There was enough kindling and scraps to make a small fire. I couldn’t imagine trying to keep it going all night and it wasn’t needed for a signal fire – yet. 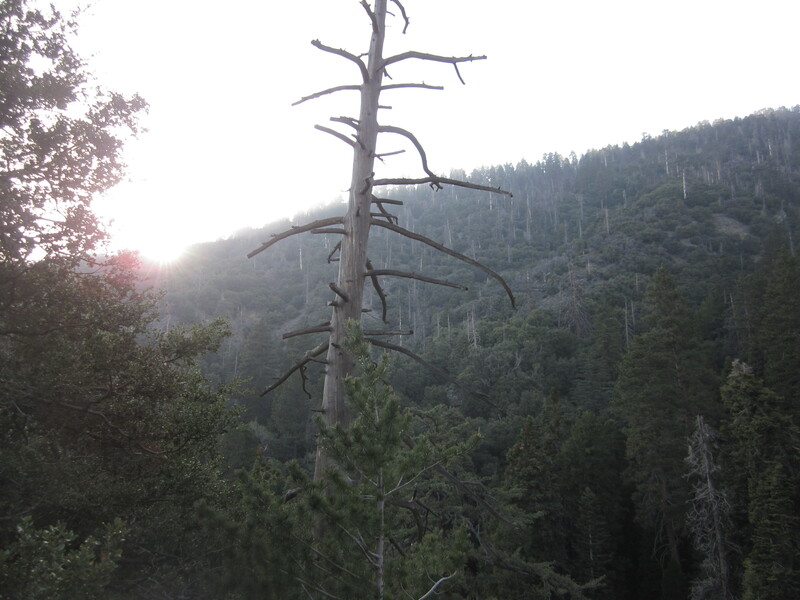 I was also a bit paranoid about setting the San Gorgonio Wilderness on fire and ruining the forest for everyone else. In 2003, the San Diego County Cedar Fire burned over 280,000 acres, destroyed 2,820 buildings and killed 15 people. It was caused by a lost hunter who lit a signal fire. http://en.wikipedia.org/wiki/Cedar_Fire Eventually, I let the fire go out. I finally settled into an uneasy sleep, not really asleep but one like you’re in a strange hotel room and you wake up confused. The sound was strange, in my dream it was a rustling sound. Except it wasn’t a dream. I woke up under the space blanket and peeked out from under to see what the sound was. My eyes strained to see the shape that was nearby. The shape snorted and began to move away. Omigosh, it couldn’t be! A bear came upon me and was dragging something. I shouted at him, “Hey that’s my backpack!”, but Yogi kept taking my bag away. Knowing better than to wrestle a bear for my belongings, I tried throwing rocks at him. Probably not a good idea, but I was mad and not thinking properly. The rocks only made him trot away with my bag and he disappeared. I went back to my bed of pine branches and sat down. As the adrenaline faded, I started trembling from the encounter of a black bear only a couple of feet away from me. Thankful that they aren’t normally carnivores with human appetites, I was demoralized from losing my belongings to a stinkin bear. 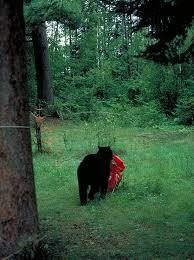 It was impossible to sleep from that point on as the thought of another ursine visit plagued me. I was down to a cell phone, my wallet, keys and the clothes on my back. My pack had the water, emergency supplies and food. I began to wonder what else could go wrong when something cold landed on my nose. I went to flick it away and nothing was there. Another piece of coldness landed on my eyelash and then another. Wonderful, the 30% chance of snow flurries just turned to 100%. Clouds must have rolled in over the last couple of hours because I could no longer see the moon or stars. For a moment, I felt like Job and asked God if he hated me. However, Job knew that God loved him and so did I. He would see me through this. The flurries turned to a light snow and I noticed the landscape became somewhat brighter. I huddled under the pine tree with my space blanket and thought about my wife and warm bed 100 miles from here. I knew that I would get out of this situation and continued to pray for safety and that the temperature wouldn’t drop much more. 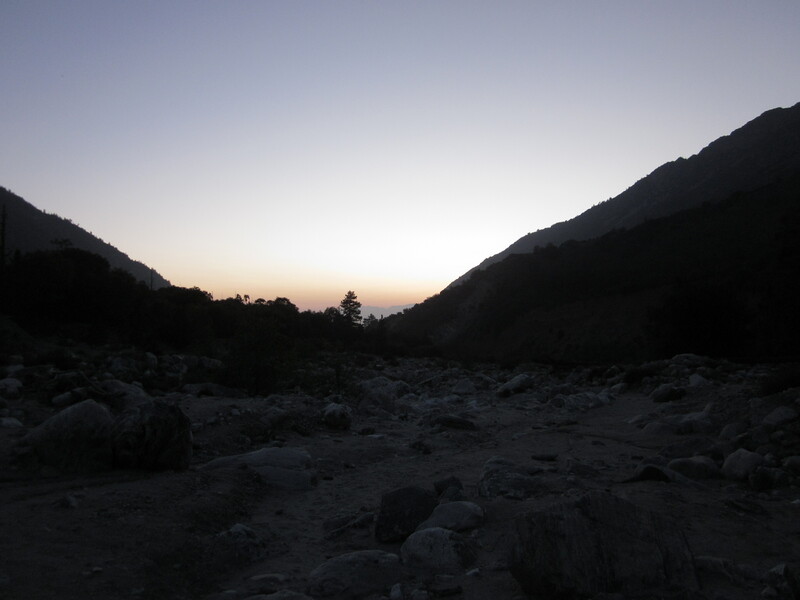 The night seemed to last forever and the sound of pine cones and branches falling unnerved me for several more hours. The snow would continue and provided a cold blanket over the barren landscape. Eventually, the sky started to gain some color. I made up my mind that once there was enough light to make out east from west and some landmarks, I was getting the heck out of here. It was overcast, and the snow had stopped. I couldn’t see the sun, but was able to make out the general direction of where it was. Knowing that I needed to head west-southwest, I began a slow traverse toward what I hoped was the trail. The snow had accumulated a couple of inches, so it wasn’t difficult to walk. Eventually, I broke out into a meadow with a lot of downed trees. It looked vaguely familiar, but the dusting of snow covered any trail that might exist. Continuing in a westerly direction, I heard what sounded like water flowing. That was a good sound and immediately boosted my morale. The stream was a vernal one, but ended up cutting through a trail. Hallelujah!, I found the trail. I almost ran to Alger Creek, but saved my energy and focused staying on the path. Crossing Alger, I knew that cell phone reception was within 30-40 minutes. The path had less snow and estimated that the altitude was around 7,000 ft. Seeing Mill Creek Canyon through the trees ahead, I tried the cell phone and got two bars. The phone was working and I was able to get through to my wife. I explained some of what happened, leaving out the parts about falling down a steep hill, the bear and snow. No need to worry her you know. The snow disappeared around 6,000 ft. and I emerged into the Mill Creek Wash where I ran into a day hiker heading up. It must have been around 8 a.m. I didn’t tell him about my ordeal, but he did give me the strangest look. After I got to the car, I could see why. My face was covered in dust and I had abrasions on my cheeks. On my drive home, I had plenty of time to think about the past 24 hours. In my rear view mirror, Ol’ Greyback (Mt. San Gorgonio) faded in the distance. Credit for the 10 essentials – Mountaineering: The Freedom of the Hills, by Mountaineer Books. The sun was rapidly sinking below the ridge as I struggled to get my bearings. As it dropped out of sight, it would be dark in 45 minutes. A bit of panic set in as I lamented over my ineptness. Headlamp shattered, my flashlight was gone. Banged up and lost, it was going to be a long night. Coming up on three years of hiking, I’ve spent many hours learning about backcountry navigation, survival and general stories of thru hikers on the Pacific Crest Trail and Appalachian Trail. I’ve managed to put some of it into practice and have never been lost for more than a couple of hours. In southern California it seems that a hiker gets lost almost every week. What follows is a tale of something that I hope never happens to me – or you. The day began like any other solo hike. I picked my route out ahead of time, texted my wife with my intended route and off I went. It was late March and there was plenty of daylight left. 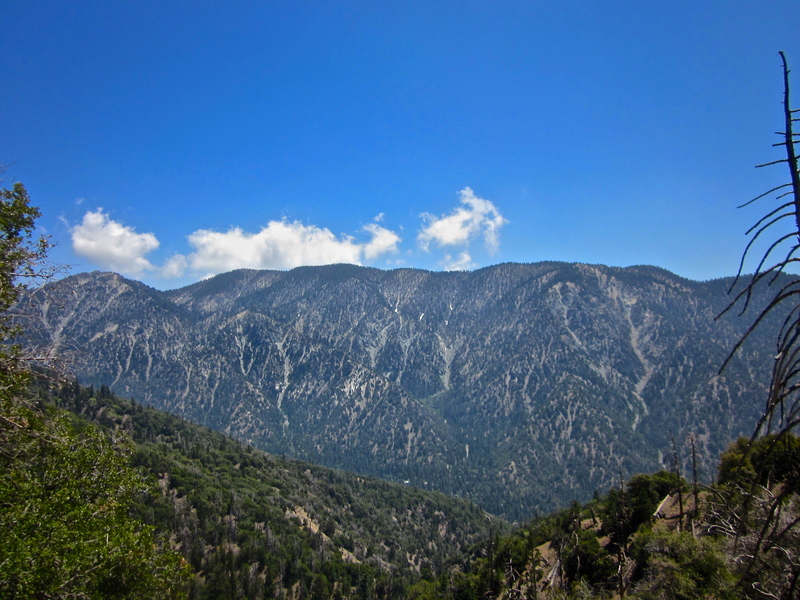 The Momyer Creek Trail in the San Gorgonio Wilderness, is part of the San Bernardino National Forest. This area is loaded with challenging trails, many intersecting and often leading to multiple summits over 10,000 ft. The trail, one of the less popular in the area is peaceful and offers good solitude. It’s also one of the least maintained with many blowdowns and much erosion. Volunteers take care of these trails and it is hard work, so no complaining here. It was also early in the season and there was still snow at the higher elevations. I had checked the weather before leaving and it was pretty standard for early spring in the mountains of southern California. Above 6,000 ft, daytime highs in the 60’s, night-time lows in the 30’s with a slight chance of flurries above 7,000 ft. after midnight. The hike up Momyer was a good workout, mostly a single track trail that generally followed an easterly direction. By late morning, the sun was warm and the sounds of the woodpeckers echoed through the forest. I stopped every couple of miles to rest and take in the surroundings. So far, no other hikers were around. Off in the distance, the rumbling of a rock slide could be heard. The melting snow must be loosening the granite on the slopes of “Old Greyback” as San Gorgonio Mountain is affectionately known. My goal was to hike to 9,000 ft. and turn around. Stopping in Saxton Camp, I had a snack and noticed that it was around 4:00 p.m. Thankfully, Daylight Savings Time was a couple of weeks ago, so I could reach the trailhead by nightfall. Yep, 7 miles to go, I can do that. As I was making my way down, I came across a landslide on one of the slopes. Debris totally blocked the trail. It was a steep talus, too steep to climb. The drop-off was even more precarious and too risky to traverse. No problem, I would backtrack and find a way above the slide. With approximately 90 minutes of daylight left, this needed to be a quick detour. I have a headlamp and flashlight, so I was prepared in case of a delay. Checking my map, I estimated that I was around 7,500 ft. and in an area of steep slopes for a half mile in each direction. 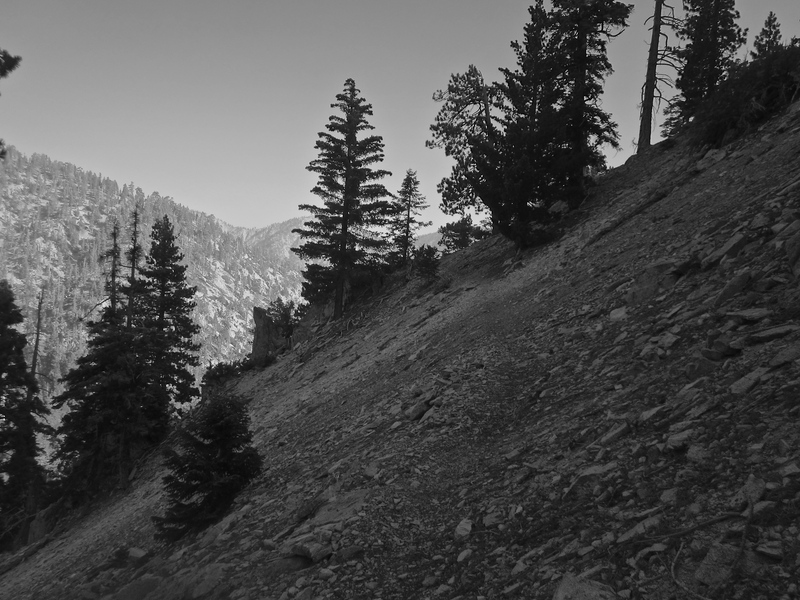 Going back, it was difficult to find a path up a slope that wasn’t covered in scree, those loose rocks and pebbles. After about 15 minutes, I noticed an easier route and began a climb up. Reaching a clump of trees, I could see the trail below. Holding my hand up to the sun, I noticed two fingers between the sun and the ridge. That meant 30 minutes until it dropped out of sight. Looking around for a reference point, that’s when it happened. One second I was standing next to a Jeffrey Pine and next thing I knew I was sliding downhill. Trying to slow myself down, I attempted to dig in with my heels. That wasn’t having much of an effect so I rolled over trying to grab the scree with my hands and clawed as much as possible. Digging my knees in, it felt like I was gaining more speed and bringing the mountain down with me. Then, there was a sensation like the bottom dropped out, and I landed on a ledge. The abrupt drop knocked the wind out of me. I was gasping like a fish out of water. Well that sucked. After what seemed like an eternity, I rolled over and sat up to assess my situation. No broken bones that I could tell, lots of cuts and abrasions and a goose-egg on the side of my head. One hiking pole was still strapped to my hand, the other nowhere in sight. Worse yet, I was disoriented and unsure of where the trail was. Covered in a light, powdery dust, I must have been quite a sight. A crow flew over me and cackled. I’ve always disliked those birds. Before the sun went totally down, I checked the supplies in my daypack. Emergency kit, first aid kit, water, snacks, gloves, knit cap, warm jacket, extra socks – you know the ten essentials and then some. My headlamp was a casualty of my excursion down the slope, the lens busted and bulb gone. The Otter Case protected my phone from getting demolished, but no cellular signal. I cleaned my wounds, none of the cuts too deep. The lump on the side of my head concerned me a bit, but I didn’t feel dizzy or lethargic. Looking for my backup flashlight, it wasn’t in the side pocket of my pack. What else could go wrong? With the sun setting and no light I needed to find shelter for the night, out of the winds that would come in from the northeast. Searching the immediate area, I located a spot that looked ok. The patch of flat dirt was clear of widow-makers, you know the dead trees that can drop branches and crush you in the middle of the night. I collected some pine boughs to insulate the ground near a boulder about the size of my car. I had about 1.5 liters of water, a couple of snack bars and an apple. I pressed the button on my Spot GPS to alert my wife that I was ok. Hopefully, she gets the message. Unfortunately, it is a one-way transmitter. Like many areas in the mountains, cellular coverage is sporadic. Checking my phone one more time, I was disappointed to see no signal. Wait, one bar but no 3G – would it work? I tried a call, but it failed. Tried sending a text and it failed too. Oh well, better save my battery for when I do have a signal. The last bit of light faded from the sky. No city lights for reference. Pulling out my jacket and space blanket, I settled in and stashed my pack to the side. Hearing crickets, the sky turned darker shades of blue, some pink and then black. Stars began to emerge as the daylight faded. A waning crescent moon was my only nightlight. My eyes adjusted somewhat and I prayed for an uneventful night.